Will Ukraine have any borders by 2015? Earlier this month Ukraine border service officials “significantly restricted” entry of adult males from Russia. Unsurprisingly, this human rights violation went almost unnoticed by international HR organizations. Ghetto-style segregation in the 21th century is a sad reality on a territory of chaos and violence, formerly known as Ukrainian Republic. According to the Ukrainian State Border Guard Service, Ukraine has enacted an entry ban to its territory for all Russian males aged between 16 and 60. This ban also includes individuals from Russia’s Crimea and the city of Sevastopol (men aged 16-60 and women aged 20-35). Ukraine State Border Guard Service sanctioned the so called “filtration and verification activities” in a failed attempt to “punish” the antifascist activists of popular uprising in Novorossia. According to unverified reports of the local media, interim “authorities” in Kyiv have also begun the construction of large detention facilities in the Central regions of the country. These prisons are supposedly to be used as concentration camps for rebels, opposition leaders and dissidents during the coming counterinsurgency operation, announced by junta warchief Turchinov. No wonder, many people in Donetsk, Charkiv and Dnepropetrovsk feel insulted and betrayed by the radical nationalists in Kyiv. 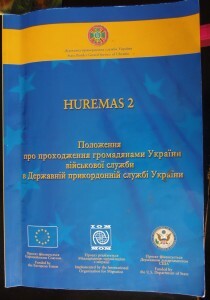 Frontpage of the «Regulations for the military personnel in Ukraine State Border Service». with the logos of the EU and US Department of State. Political radicalization of Ukraine State Border Guard Service started in 2004 under Victor Yushenko’s presidency. Revised version of the official «Regulations for the military personnel in Ukraine State Border Guard Service» was printed on the United States and the European Union taxpayers’ money as part of the HUREMAS2 personnel management project. Why is this document so important? It contains basic guidelines for all military personnel of the Ukrainian State Border Guard Service. The fundamental manual was finally approved by president Yushenko’s special decree № 1115/2009 on the 29th of December, 2009. It is fair to assume that the U.S. State Department specialists and the European Union officials may have supervised the document that they funded. According to former U.S. Ambassador to Ukraine John E. Herbst, the State Department dropped at least $425 000 on the first HUREMAS initiative from 2006 to 2008. Former chief of the Delegation of EU to Ukraine Ian Tindall Boag promised up to €4 million funding till 2008. HUREMAS2 financial details are still unpublished but project closure is planned in 2015. Border Guard Services of Poland and Hungary are mentioned as junior partners that could help bring Ukraine State Border Guard Service in line with the EU legislation and NATO procedures. The final goal of HUREMAS2 may be to transform the Ukraine State Border Guard Service into an instrument of deterrence on the outskirts of NATO’s targeted sphere of influence. One of the major lobbyists for HUREMAS2 project was a chief of the State Border Guard Service of Ukraine Mykola Lytvyn, a Yushenko protégé, who finished a military course at the Harvard University (1997). Ironically, thanks to the comprehensive “technical assistance” by the US and European partners, Ukraine will most likely have no borders to guard by 2015.